The Trick Ghost (トリックゴースト, Torikku Gōsuto?) is an Emblem Heartless that appears in Kingdom Hearts II. The Trick Ghost can be viewed rightside-up or upside-down. 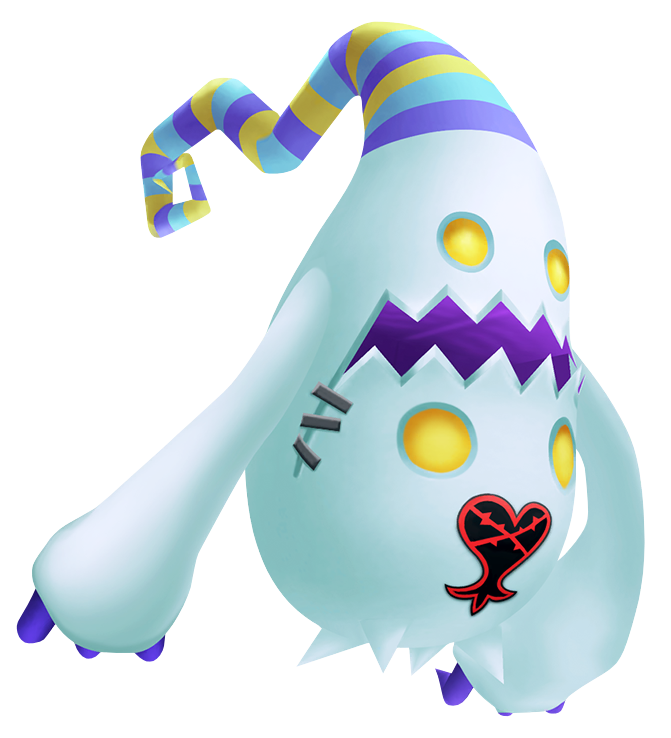 Regardless of which half of the Heartless is on top, it has long, white arms with three short, purple fingers at the end of each one. Its body is predominantly white, and it has four yellow eyes—two for each face. Its mouth is jagged and purple on the inside; it also has what seem to be stitches on its corners. When right side-up, the Trick Ghost's mouth seems to be frowning, and its head is tipped with a long, curled antenna. This antenna is decorated with horizontal stripes of purple, tan, and lilac. Its Heartless emblem is on the lower half of its body, between the eyes of the second face. When upside-down, the Trick Ghost seems to be smiling, its head sports several short spikes, and the antenna on the normal face serves as a tail. 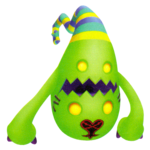 In Kingdom Hearts II Final Mix, the Trick Ghost's white body is light green, and the stripes on its antenna are yellow, blue, and sky blue in color. The Trick Ghost's name refers to its resemblance to a ghost. A "trick" is an "act or scheme intended to deceive or outwit someone." This could possibly refer to the Trick Ghost's ability to change its battle style depending on how it positions its body. Shot (ショット, Shotto? ): The Trick Ghost fires dark projectiles at its target. Rousoku Attack (ロウソク攻撃, Rousoku Kougeki?, lit. "Candle Attack"): The Trick Ghost strikes its opponent with a lit candle. Three-in-a-row Shot (3連ショット, 3-ren Shotto? ): The Trick Ghost fires three dark fireballs at its target. Muchi Attack (ムチ攻撃, Muchi Kougeki?, lit. "Whip Attack"): The Trick Ghost whips the opponent multiple times with its head. Trick Ghosts are almost like two enemies in one. They attack from a distance when in the air by launching dark fireballs at their targets from the candles they hold. These enemies may also attack by firing wisps of dark energy that zigzag slowly across the battlefield. When Trick Ghosts appear on the ground, they flip onto their heads and use close-range attacks to damage their foes. While not particularly powerful, these Heartless have a tendency to float high above their enemies' heads. This makes them difficult for grounded foes to destroy. This page was last edited on 3 April 2019, at 19:05.